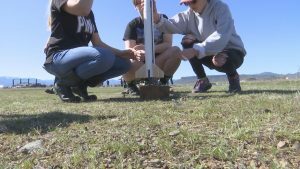 CENTRAL POINT, Ore. —Some North Medford high school seniors are aiming high to have a chance at competing in the Team America Rocketry Challenge this year. Eleven students from the high school met Sunday morning to practice flying their rockets. “It’s a part of our senior project and it’s just one part of it,” said Gabby Parks, senior at North Medford high school. This is the first year the school will have three teams. They are being challenged to build a rocket from scratch following the guidelines that the competition has set. They’ll be tasked with shooting each rocket nearly 850 feet into the air and having it land back on the ground in under 43 seconds. The teams will put their rockets to test on April 6th at 1:00 p.m. at Denman park in Central Point. If they make it in the top 100, they will move forward to compete with other high schools from across the nation in May.